The week of little posts about little things I love in our apartment draws to a close today! 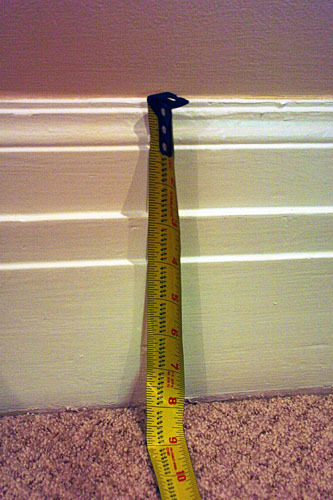 If you can’t read the measuring tape, we have baseboards that are over eight inches tall. They’re so architectural, so dramatic! They make me want to push all the furniture to the middle of the room so I don’t obscure the beautiful chunky baseboards! So I guess even if the rooms lack balance due to the lack of crown moulding, at least these baseboards have enough interest to compensate. 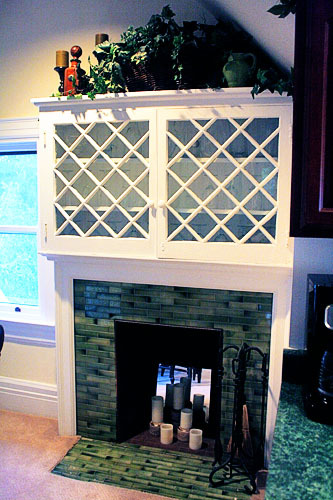 Okay, perhaps this isn’t a “little” thing, because it makes quite a big statement in the eat-in area of our kitchen. 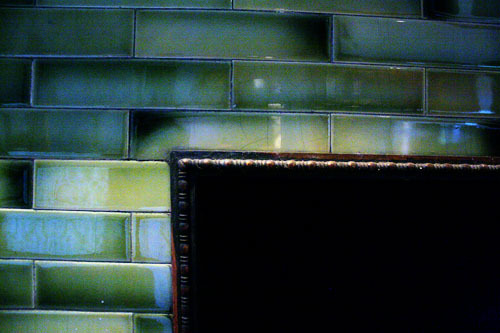 And below, the green subway tile with metal trim (original? not sure) is just stunning up close, cracks and all. The fireplaces throughout the house (including another one in our living room) are all non-functional and purely decorative. And this one is, indeed, super decorative! There are more things I could go on about – the doors, one reader mentioned the doors and yes, they are fantastic – so I may have to continue this list later. And after two weeks of nerd camp, missing home, I’ll appreciate all these details even more! And do hurry home!!! It feels odd and uncomfortable to me when you out-of-pocket... Love you!